Since the MC only got lack of part, under such circumstances Tohoshinki had to overcome it by their own. As they finished performing Summer Dream, Jaejoong started the conversation, “This is the fifth time that we’ve come to Sendai, the air here is really fresh! Yeah, even if we compare it to the weather in Seoul, it’s not that cold. Today is so sunny.” he said. Yoochun was in fact getting cold, he couldn’t stop coughing. He looked like he suffered a lot. I hope he’s getting well soon. His hair was also getting longer than before. Junsu told everyone that he already ate beef tongue. Tohoshinki’s lunch was ordered from a restaurant in Zepp Sendai. Then there was a simple discussion about ECOLIVE. 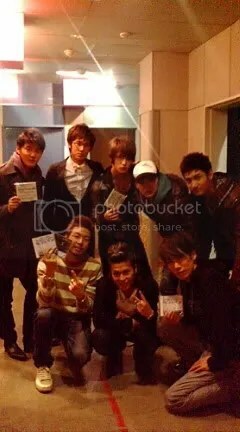 Actually Tohoshinki got invitations from other Japan events that day, since the boys were really concerned about ECOLIVE, they decided to come here. Tohoshinki looked so relax, it’s a really fun event that can’t be told only with words. Therefore, Sendai will broadcast this live event in March. This entry was posted on March 3, 2009 at 2:55 PM and is filed under Translations with tags THSK, Tohoshinki. You can follow any responses to this entry through the RSS 2.0 feed. You can leave a response, or trackback from your own site.